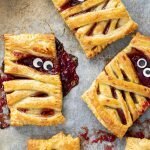 These Mummy berry hand pies make the most adorable Halloween treats. 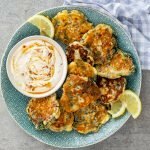 Using only a handful of ingredients, they couldn’t be easier and they’ll be a sure hit! OK guys, let’s talk about these hand pies for a minute. Have you ever seen anything so adorable? 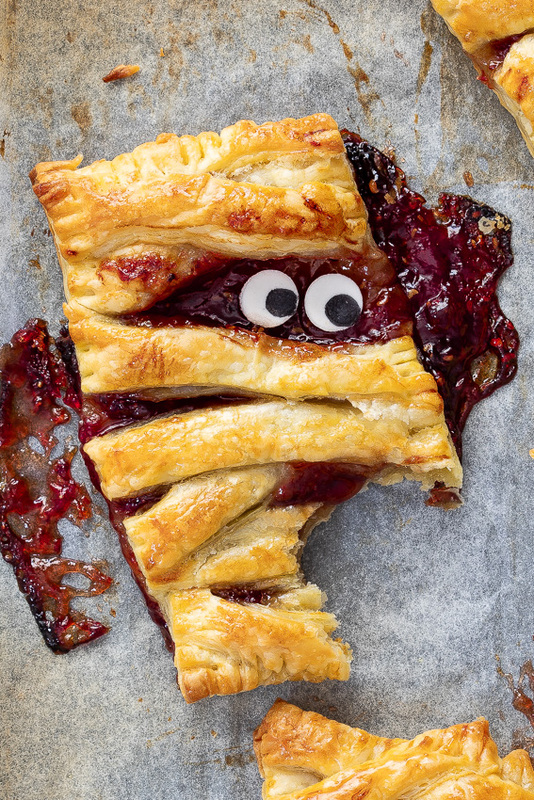 I made these pies filled with berry preserves/jam a while ago and they were such a hit with my kids, I knew I had to put a Halloween-spin on them. 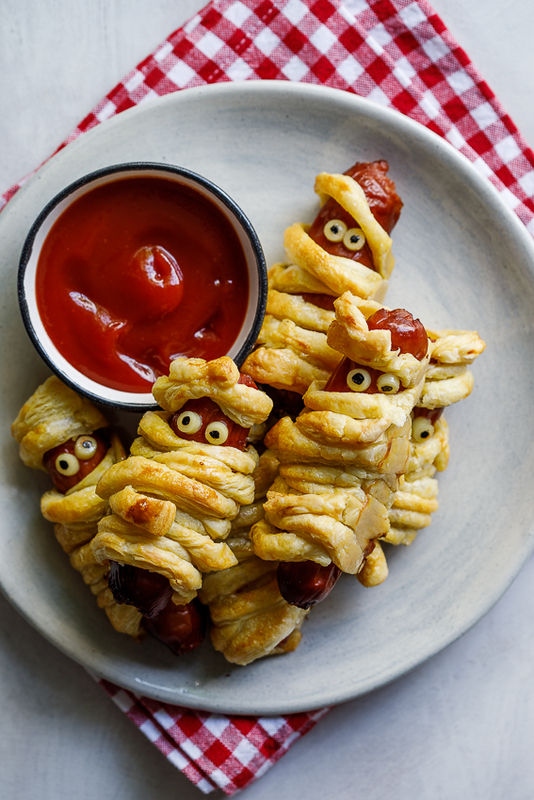 Last year I made these mummies-in-a-blanket and because I thought they were just too cute, thought I would steal the idea for this hand pie recipe. 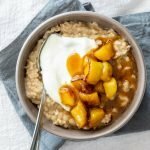 All you need is 3 ingredients (I’m not counting the googly eyes since they are optional) and a few minutes to throw these together. 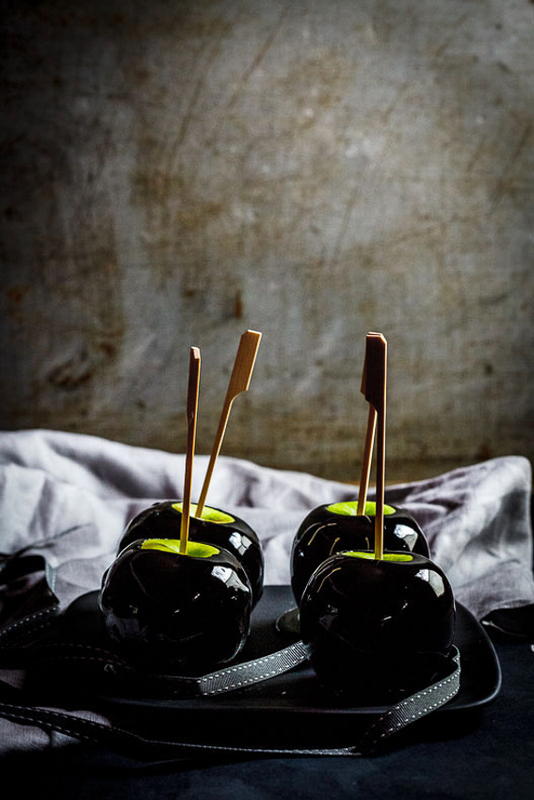 They make perfect Halloween treats, would be great in a lunchbox and are just delicious for dessert served with a scoop of vanilla ice cream. Definitely. Because dough/pastry freezes so well, these hand pies are an ideal freezer treat. Assemble the hand pies all the way then freeze in on a parchment-lined baking sheet until frozen solid before transferring to a freezer-proof container. Before baking, brush with egg and pop in the oven and bake from frozen. Easy peasy! Because the filling should need no cooking, hand pies only take 10-15 minutes to bake. When the pastry is crisp and golden brown the hand pies should be ready to be removed from the oven. You can fill hand pies with absolutely anything so apple pie filling, cherry, pumpkin, peach and berries all work well. 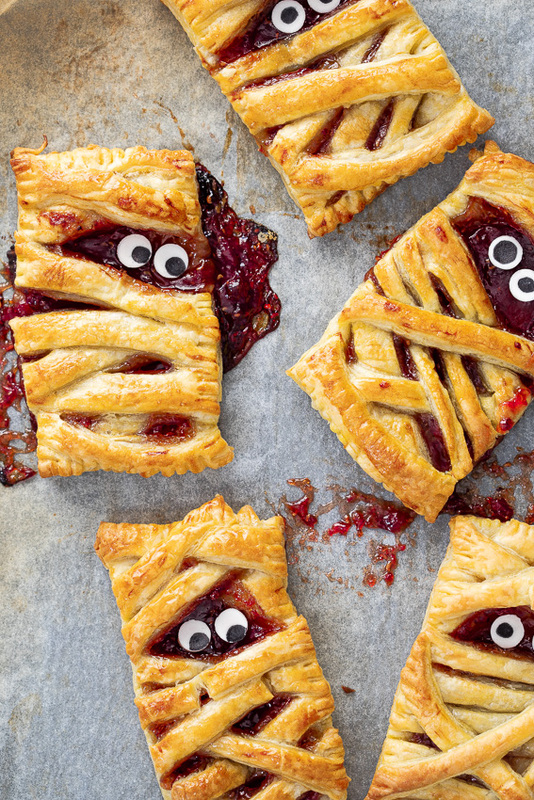 These Mummy berry hand pies make the most adorable Halloween treats. 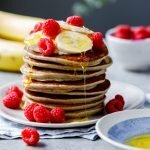 Using only a handful of ingredients, they couldn't be easier and they'll be a sure hit! Lightly dust a cutting board with flour then lay one sheet of pastry on the board. 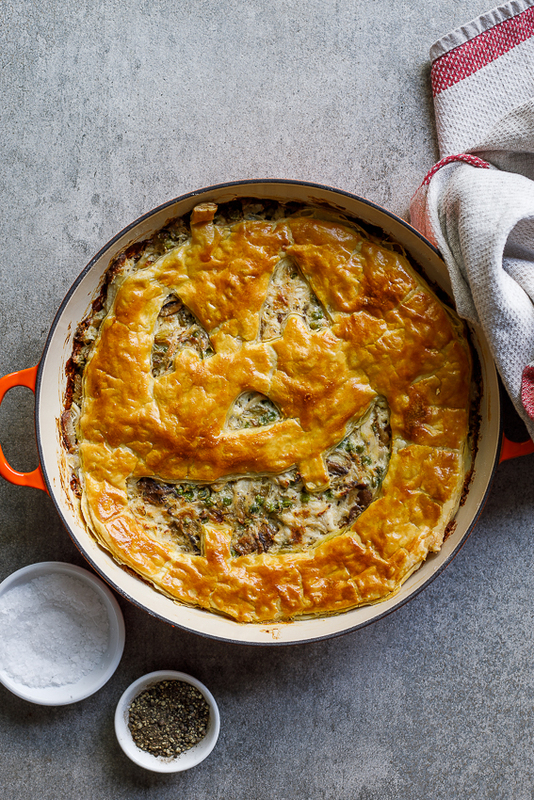 Using a pizza cutter/large knife, slice the puff pastry sheet into thin strips then set aside. Cut the other sheet of puff pastry into 6 equal rectangles. 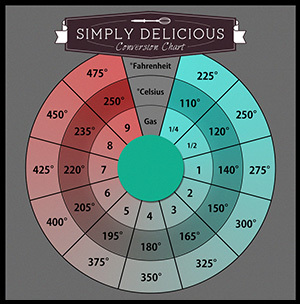 Place the pastry rectangles onto a baking sheet lined with parchment paper. Place 1-2 tablespoons of berry preserve/jam in the center of each rectangle then brush the edges with egg. Layer a few strips over the jam, making sure to leave space for the googly eyes (if using). Crimp the edges of the pie with a fork then brush the tops with beaten egg. Place in the oven and allow to bake for 10-15 minutes or until the pastry is golden brown and puffed. 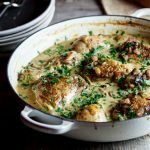 Remove, allow to cool to room temperature and serve. They are made of fondant/modelling paste. But you can buy googly eyes from many baking supply stores. 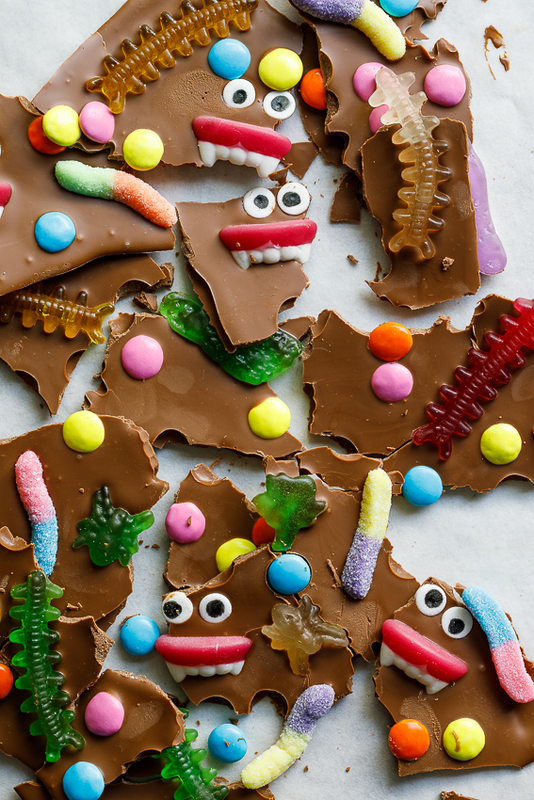 I tested these tonight as I want to make them for my kids’ Halloween party at school this week and they are SO GOOD. The kids ate ALL of them and I doubled the recipe! My kids loved these. I didn’t have the little eyes but they loved the jam with the pastry. The eyes are festive but definitely not a must. So glad your kiddos liked this. 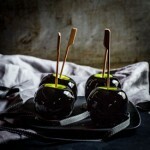 All your Halloween treats are fabulous Alida! These are so adorable! LOVE pies these. Definitely making them for my boys soon!